The factors affecting the quenching temperature of the alumina foam ceramic filter plate in the roller kiln are compared with the relationship between the height of the fire plate, the residual heat pressure, the product size and the quenching fan and the quenching temperature, and the reasons for the relationship are analyzed. . The test results prove that the product specifications are certain, and the gear is reduced by not significantly increasing the energy consumption of the firing. The height of the fire plate, the increase of the residual heat pressure, and the shutdown of the quenching fan to increase the quenching temperature are advantageous for improving the mechanical strength of the foamed ceramic product and reducing the slag. 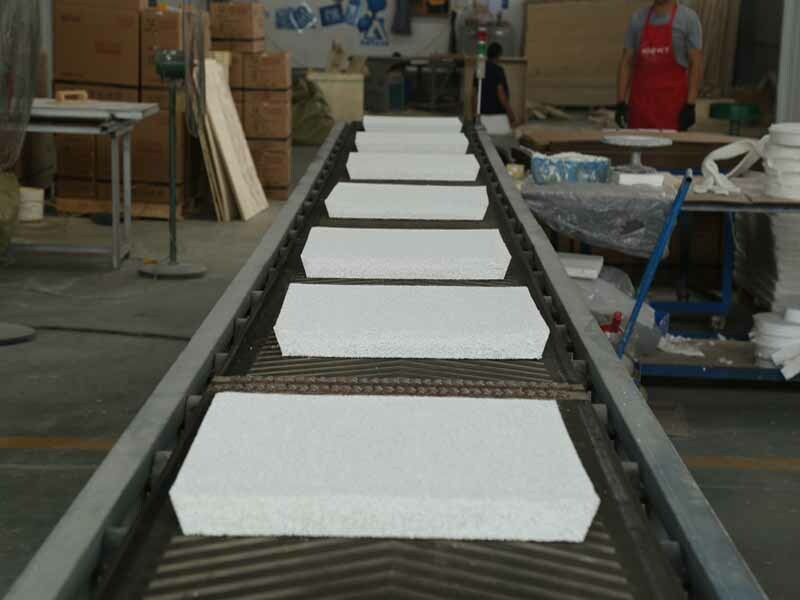 In industrial production, considering the cost, quality, process and other factors, most domestic manufacturers often control the firing temperature of alumina foam ceramic filter plates (hereinafter referred to as foam ceramics) at 1250°C. The performance of the products produced must also meet the JC/T895-2001 foam ceramic filter industry standard: through hole ratio ≥ 80%, flexural strength ≥ 0.3 MPa, compressive strength ≥ 0.5 MPa. Ceramic Foam Filter Manufacturers, In the process of sintering foam ceramics, many manufacturers choose to abandon the firing method due to the concentration of flue gas, large discharge, difficult gas treatment, and unsatisfactory treatment. The tunnel kiln is large in height, small in width and large in temperature difference, and is not suitable for sintering of large-size alumina foam ceramics. The roller kiln has the characteristics of large width, stable product quality, small temperature difference, continuous exhaust, flue gas can be introduced into the high temperature zone as combustion air, energy saving and environmental protection, and is more suitable for alumina foam than shuttle kiln and tunnel kiln. Sintering of ceramics. The quenching fan is placed behind the high temperature firing zone of the roller kiln and in front of the residual heat fan. The main purpose is to rapidly cool and cool the ceramic products at high temperature to avoid liquid phase crystallization and grain growth of the product. Thereby improving the mechanical strength of the product. For the roller kiln firing building or daily-use ceramics, the quenching fan controls the quenching temperature by the amount of air introduced into the quenching duct, and the quenching temperature is different. There are also differences in product performance. Sometimes the quenching temperature is not well controlled, which not only does not improve the mechanical strength of the product, but also causes the ceramic product to crack.